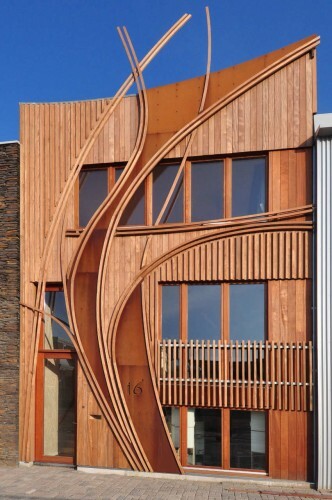 Within the urban plan of Nieuw Leyden, 24H > architecture design two ecological houses. The building block consists of 18 houses, designed by different architects. There are no regulations of the beauty commission, so the future owners are free to design their house, as long as it fits within the provided building envelope. The density of the area is high and the width of the street is minimal. To provide its inhabitants with maximal daylight during the day, a so-called ‘canyon’ is introduced. The canyon flows through the house and encloses the stairs. It’s orientated in a way that light falls to the lower floors.